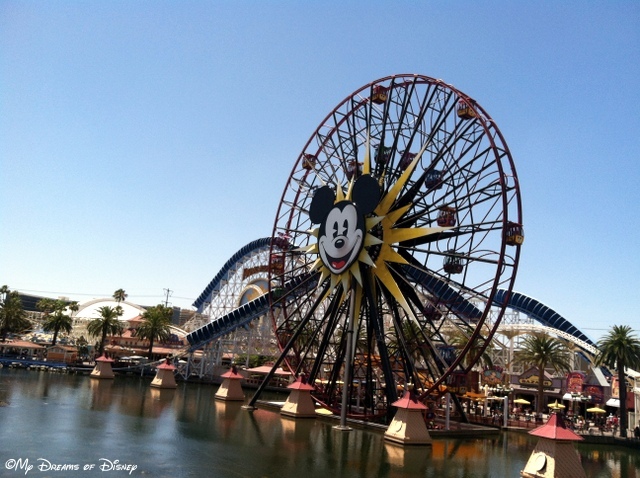 Disney’s California Adventure — the park has a lot going on there, doesn’t it? With the all new Cars Land, Paradise Pier, and all the other places to see and do things, how am I going to choose just five things that I think are my top five for the park? 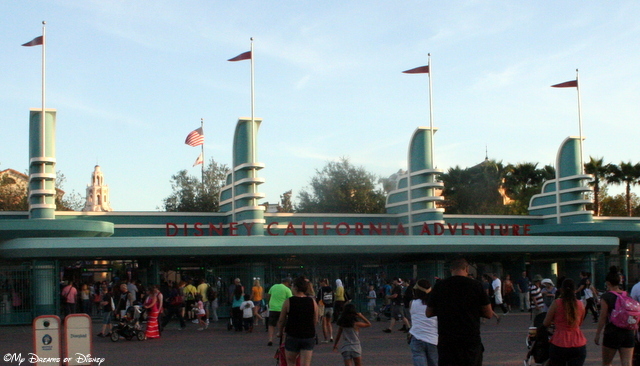 Well, let’s see how I did in my top five California Adventure attractions countdown! I hope you enjoy my choices! If you want to see what my other choices were for other parks, last week we did Disneyland Park, and before that we did Magic Kingdom, Epcot, Disney’s Hollywood Studios, and Disney’s Animal Kingdom to cover Walt Disney World. Go check them out if you missed those posts! 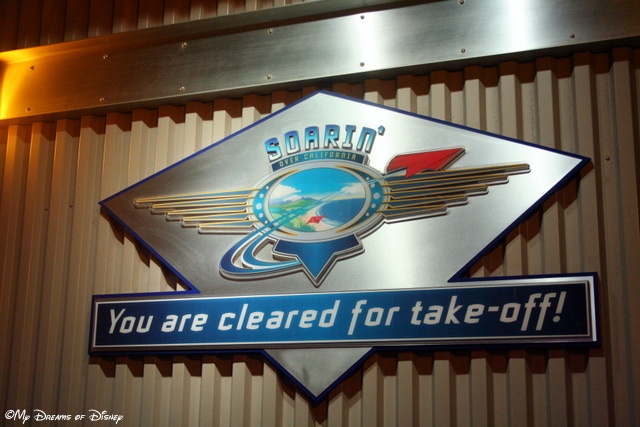 Soarin’ Over California — the same as Walt Disney World, but still incredibly cool! Soarin’ Over California was great to experience at California Adventure! I really enjoyed it, and the best thing about it: it’s in a park where it isn’t practically the only big ticket attraction, so we walked right in and waited perhaps five minutes for a ride! Oh, wouldn’t that be nice to experience that at Epcot? 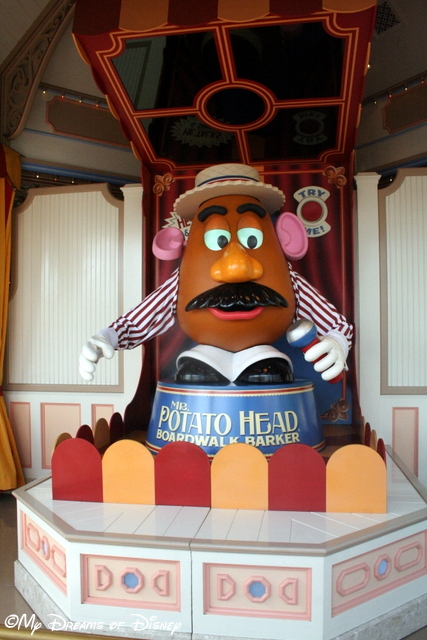 Mr. Potatohead beckons you on towards the games! The neat thing about Toy Story Mania is that it fits right in with the area of the park that you are in — Paradise Pier. This attraction feels like it’s part of the boardwalk, as if it was picked up and transplanted here, perhaps from Atlantic City…and the line doesn’t feel quite as long as Walt Disney World, but it can get long sometimes. We enjoyed it! 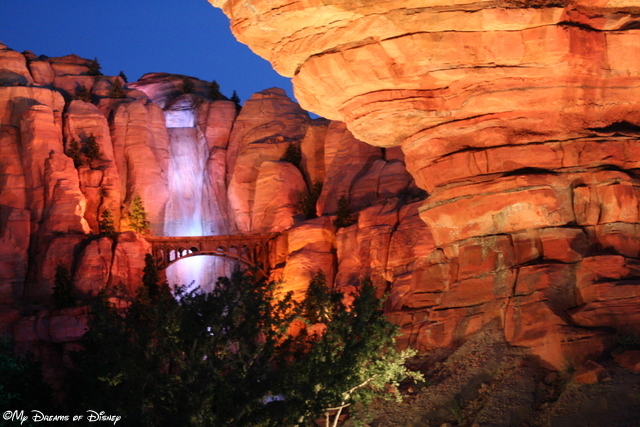 Radiator Springs Racers is in perhaps the most beautiful land at California Adventure! Radiator Springs Racers — the crown jewel of Cars Land — has a lot going for it, but for me, perhaps the best part of it all is the beautiful scenery and the way the Imagineers truly immersed us right into the middle of Radiator Springs. Cars Land itself is a great land to visit, but the true beauty of this land is seen at night, with all of the Neon on, and the beautiful scenery over by Radiator Springs Racers. The only problem I have with this attraction is the line, and how incredibly long it is, even with FastPass tickets. 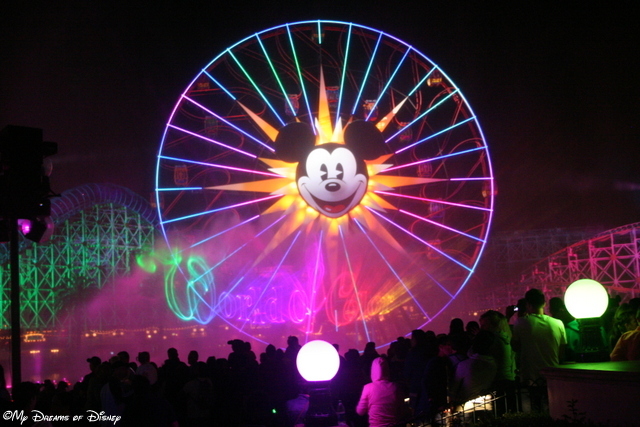 The World of Color is a beautiful display of musical genius! I have seen many videos of the World of Color show, but until I actually saw it in person, I didn’t know how deprived I was. This show — without a doubt — is the BEST show in any Disney park in my opinion. I love the way they use water, lasers, color, fire, music, and video to create such a compelling storyline, and how it feels as if you are watching a story unfold right in front of your eyes. We were blessed to have our balcony look right over part of Paradise Pier, and while we couldn’t see the show from our vantage point, we could definitely hear the incredible music. 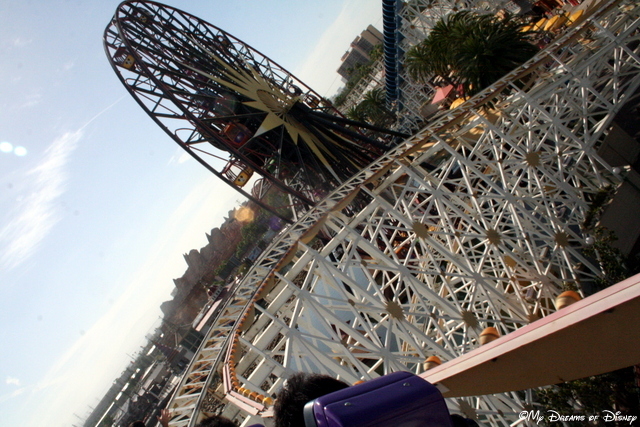 California Screamin’ — bar none, the biggest thrill ride at Disney in my opinion! Sitting at the top of my leaderboard is California Screamin’! This intense roller coaster is what Rock ‘n’ Roller Coaster at Disney’s Hollywood Studios strives for, except California Screamin’ is twice as long, is outdoors, and keeps on going and going and going! Cindy and I, and even Sophie, loved this roller coaster! The Disney Animation Building has so much cool stuff, if you haven’t seen it, go check it out! Mickey’s Fun Wheel is a lot of fun — hence the name! We like both the stationary and the moving cars! The Silly Symphony Swings are one of my daughter’s favorite rides because of the freedom she experiences in riding them. Also, she likes the music, and she loves the Silly Symphony Cartoon Short that this ride is based off of! Put it all together and it’s one of the honorable mentions! 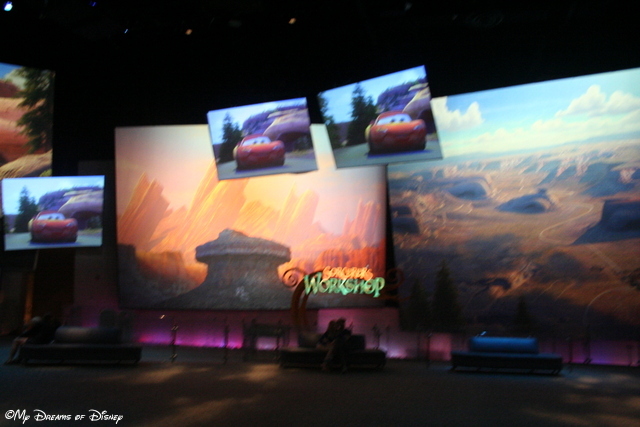 18 Days til Disneyland – Cars Land! 5 Days til Disneyland – Radiator Springs Racers! What I liked most about DCA! I live near WDW. Disneyland seems to be a whole different experience in itself. Hope to see for myself soon! Previous Post: Magical Blogorail – My Disney Arrival Strategy!